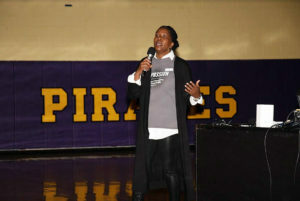 Veda Tucker, spokesperson for Rachel’s Challenge, speaks to Corinth Holders High School students about being kind and starting a chain reaction of positive behavior within their community. 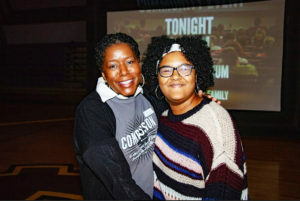 Gabrielle Miller (right), Corinth Holders High student, poses with Veda Tucker (left) after the Rachel’s Challenge presentation. 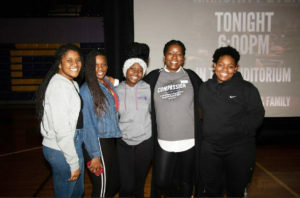 Corinth-Holders High School partnered with Rachel’s Challenge to equip and inspire students to replace acts of violence, bullying, and negativity with acts of respect, kindness, and compassion. Photographed (from left) are Shikiya Mcknight, Teyana Hocutt, Zyonna Ware, Veda Tucker, and Jahonce Howard.